What would you do if you were out for your morning stroll and saw strangers in your neighborhood? Well, if you were Rebecca, you would hurry home, rouse your mate, and send him out to deal with the situation. You can watch this interesting domestic interaction in the video archive as Rebecca awakens Kewpee and quickly sends him on his way. In the second video, taken from the parapet camera, you can see Rebecca arriving at the ledge and entering the box. If you watch closely, you will then see Kewpee leaving the box (within seconds). You can appreciate the speed of these birds as Kewpee zooms past the camera multiple times defending the territory. Kudos to alert falcon watchers on the 14th floor who noticed lots of activity and vocalizations, and saw one or possibly two additional Peregrine falcons flying nearby and notified me of the sightings. This is migration season, and most likely an unknown Peregrine (or two) was passing through. 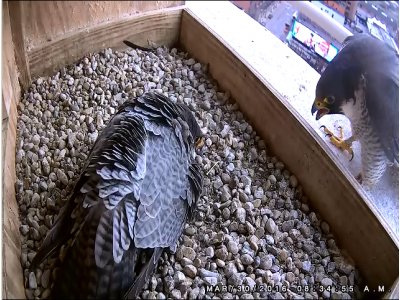 Our resident pair is territorial, especially now that there are eggs in the nest. The unknown birds did not stick around and were not reported again in the area. Rebecca was casually flying and coasting on the strong wind currents while Kewpee was back on incubation duty shortly after the incident.